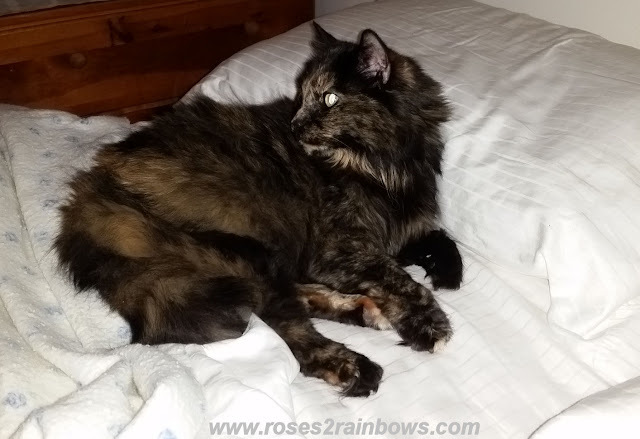 From Roses to Rainbows: Breakfast in bed, please! We have had our beautiful Sophie for almost 11 years now and she's just as sweet and quirky as ever. Like all of our cats, her personality has continued to develop over the years. After the passing of her housemates, (Dood, 4 years ago and Rosie, 5 years ago), she has been "talking" more than ever before with an ever-growing vocabulary. I believe she is either channeling the boys, or was just never able to get a word in edge-wise and is now making up for it. If she were talking in this picture, she might be saying, "breakfast in bed would be nice for a change". Do your cats talk to you, and what do you think they are saying? How fun to have a "talking" cat! She is really beautiful, lying in bed waiting for breakfast.